Mac Office 365 email backup tool allows you to export office 365 emails to PST, MBOX, EML, MSG & EMLX format. The software allows you to backup office 365 mailbox of a single user account. For this, You just need to provide valid credentials for the backup process. MacWareTools office 365 backup software allows you to take a backup of emails, calender & contacts from office 365 account. The software will allow you to select the category and export them to PST, MBOX, EML, MSG & EMLX formats. Once you have chosen to export the emails in giving formats, Software will allow you to apply date filter option to export selected emails using Advance Settings. This will saves the user time in backing up all unnecessary emails. This Office 365 email backup tool for MAC allow you to Pause the backup process and Resume it at any specific point. The same functionality performed by the software if the internet connection disconnected during backup process. While taking backup using MacWareTools office 365 backup software, user can exclude Deleted and Sent Items folder from the backup process. This is an additional feature of the software, which saves the time when you backup Office 365 emails to PST, MBOX, EML, MSG & EMLX format. This option enables you to backup only required folders. For this, you just need to click on the advance settings option and enter the exact name of the folder you want to take backup and click on Add button. This Mac office 365 export tool allows you to provide naming convention while taking backup of your emails from Office 365 account. This feature enables only, if you are exporting office 365 emails to EML, MSG & EMLX formats. You can select any desired naming option from the available options. The MacWareTools Office 365 email backup tool allow you to backup Office 365 emails with Incremental Backup option. For this, you first need to export office 365 emails to your local system and then from the next time, the software will allow you to take Incremental backup on the same machine on that account by creating a separate file for new emails. 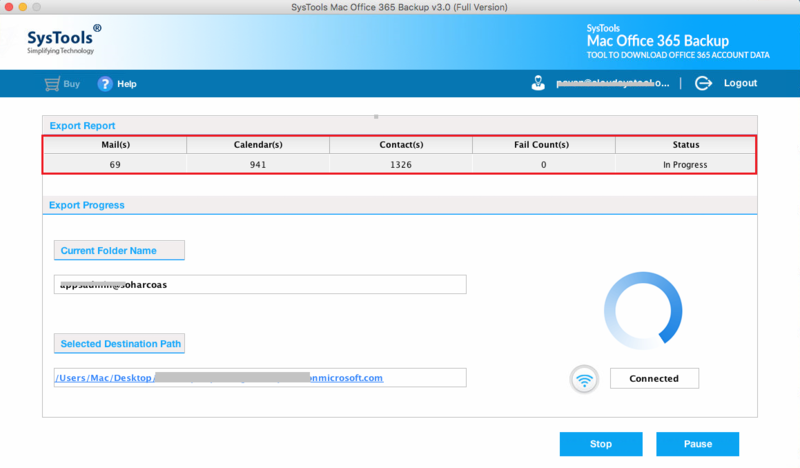 How Mac Office 365 Backup Tool Works? MacWareTools Office 365 Backup Tool is one of the best solution which can export office 365 mailbox items into different formats. It is really a helpful software with good user interface. I like this tool very much because of its advanced features especially, option to include folders. In this I only need to type the name of folder and can add number of folders in it. It is the excellent application that I have come across while searching for best Office 365 export tool. The features data filtration and delete after downloading helps me a lot. I am impressed with the new features as it is very efficient and reliable for users. 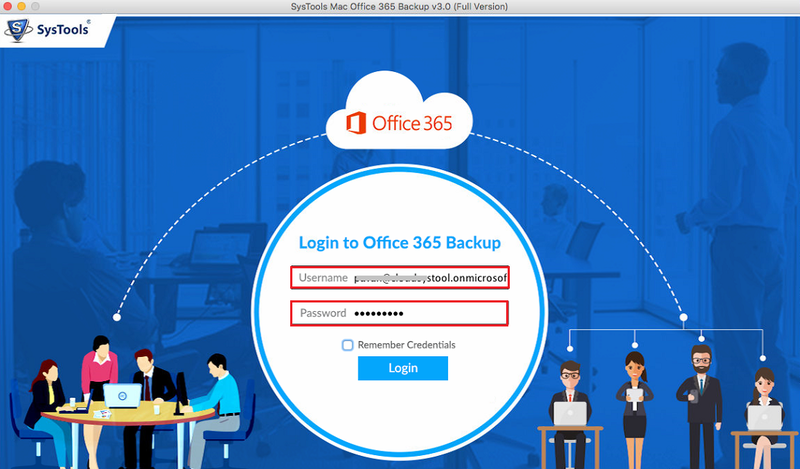 Thank you so much to the team for the Office 365 backup tool for mac. I was unable to migrate my Office 365 Mailboxes to PST files. Then someone suggested me this tool and I tried it. And literally I got the perfect solution for this. The Software exports first 100 emails and 25 other items from office 365 account to PST, MBOX, EML, MSG & EMLX formats. How can I backup office 365 mailbox to PST? Can I backup calendar from my Office 365 account using this tool? Yes, Software allow you to take backup of Emails, Contacts & Calendar using MacWareTools Office 365 Backup software. Can I export Office 365 emails to PST file format? 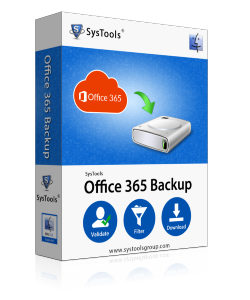 Yes, Office 365 backup and restore tool enables you to export your data from office 365 to PST, MBOX, EML, MSG & EMLX format. Does this software exports selected emails from Office 365 account? Yes, the Office 365 backup tool will allow you to take backup of selected emails using date filter option. 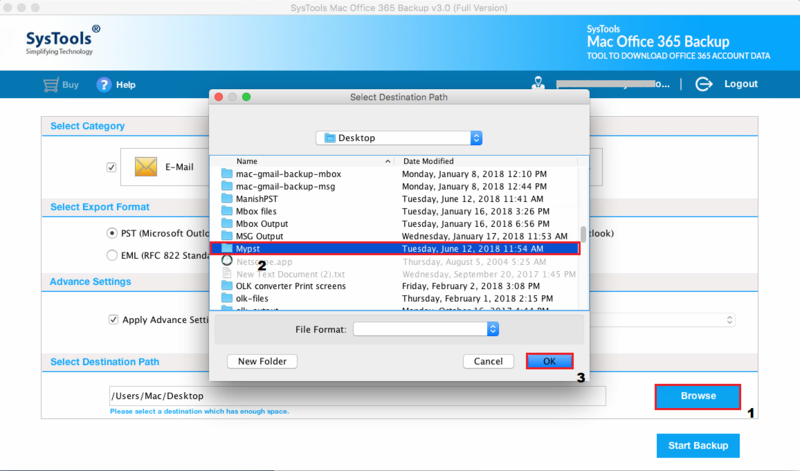 Can I backup Office 365 emails to PST On Mac OS X 10.8? 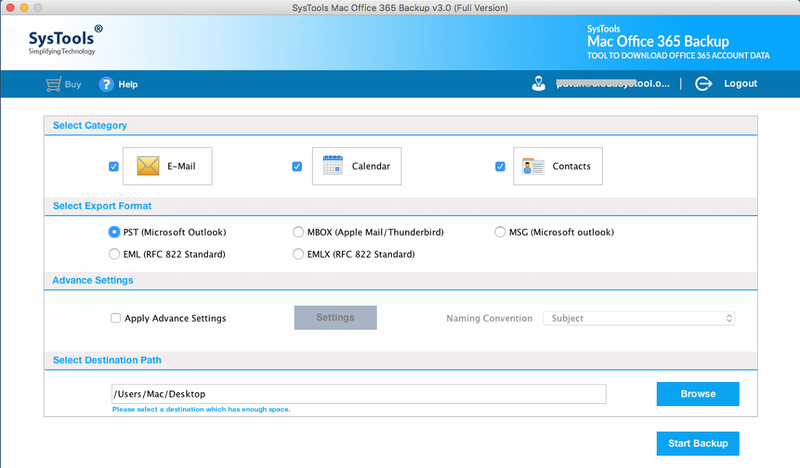 Yes, You can backup office 365 mailbox to PST, MBOX, EML, MSG & EMLX format on MAC OS X 10.8 & above versions.